Cadillac, a leading automotive manufacturer, as part of its global strategic realignment is reasserting its position as a premium brand in the Middle East via a raft of regional investments, the company said. Cadillac is on course in realising major transformations across diverse range of areas including dealer network development, manufacturing and product strategy, it said in a statement. Cadillac Middle East is following the global brand direction with an aggressive action plan to upgrade its customer experience to a new level, in concert with the regional dealer network. The brand’s global product strategy is being complemented by the development of new, corporate identity-compliant facilities in the Middle East, including recently announced projects from Kuwait and Oman, it said. In March 2018, a ground-breaking ceremony for the new multi-million US dollar project for Cadillac Alghanim was held in Kuwait’s Shuwaikh district, marking the construction launch of the brand’s first standalone dealership facility under the new brand corporate identity in the country. Attended by key executives from Cadillac Middle East and the local dealer, the event amplified the regional brand transformation and represented a key milestone in its development, it added. The new facility announcement in Kuwait comes a few months after Cadillac Alghanim launched the construction phase of another, smaller Cadillac showroom in Fahaheel. Featuring exclusive Cadillac consumer touch points, such as highly trained sales staff and luxury amenities, the purpose of the showroom will be to better service the brand’s new and existing customers in the Southern region of Kuwait. The announcement of the two new facilities in Kuwait comes at a time when a number of other showrooms and service centres are underway. 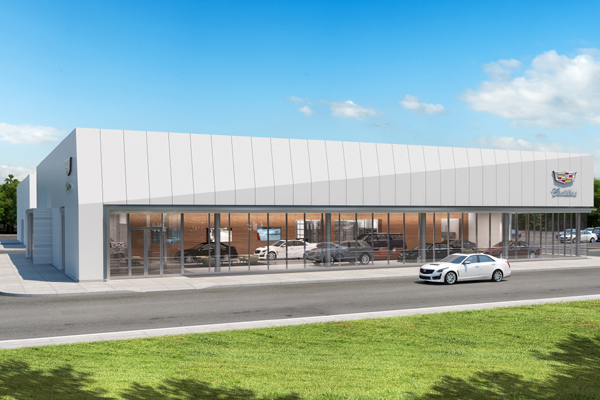 Regionwide, Oman Trading Establishments (OTE), the Cadillac dealer in Oman, has announced a new Cadillac facility set to open in the sultanate in the near future, which will also reflect the new corporate identity, said a statement. “I am thrilled to be standing today here in Kuwait as we witness first-hand our regional expansion progress as we work closely with our local dealer to build these new facilities. Our expansion plan has started to shape up with the new facility announcements in Kuwait which reflects the commitment of our partners in realising our vision,” he said. “It is coming at a time in our transformation where we will begin our major product offensive, beginning with the launch of the new XT4. With our brand, evolving we will be able to offer our customers a completely new experience from the moment they step into one of our showrooms and we welcome them into the world of Cadillac, which will become the benchmark of premium,” Soemmer continued. Cadillac’s ambitions are high as the brand continues a product offensive to more than double the number of models available in its line-up over the next four years. Over the last three years, Cadillac has undergone a significant shift in direction – using sophisticated design, technology and an authentic attitude to appeal to independently minded individuals. Starting with the launch of the first ever XT4 later this year, Cadillac will bring a new model to market every six months – a total of five vehicle lines in the space of just two years. Furthermore, these models will feature some of the most advanced technology in the automotive industry.